Located in the Croatian Middle Adriatic, with its natural beauty and historical heritage Zadar region is one of the richest in the country. As many as five out of eight Croatian National Parks being situated in this area or in its close proximity, having the splendor of almost 300 islands in the Zadar archipelago and taking pride in the rich cultural heritage and modern attractions, it is no exaggeration to say that this region belongs to the top of Croatian tourist offer. The outstanding quality of Zadar region is its favorable traffic connection, which makes it easily accessible regardless of the means of transport one chooses. Zadar airport connects Zadar with all major European cities. If you take the highway from the main border crossings to Zadar region, it will be less than a 3-hour drive. The modern ferry port, although still under construction, further facilitates the access to Zadar region by the sea. BonaMare house is located 20 kilometers from the Zadar airport and about 25 kilometers from the closest entrance to A1 Highway. Zadar – the city about which many poems have been written, the target of many conquerors in the past and the breathtaking site that is absolutely worth visiting while your stay at BonaMare house. 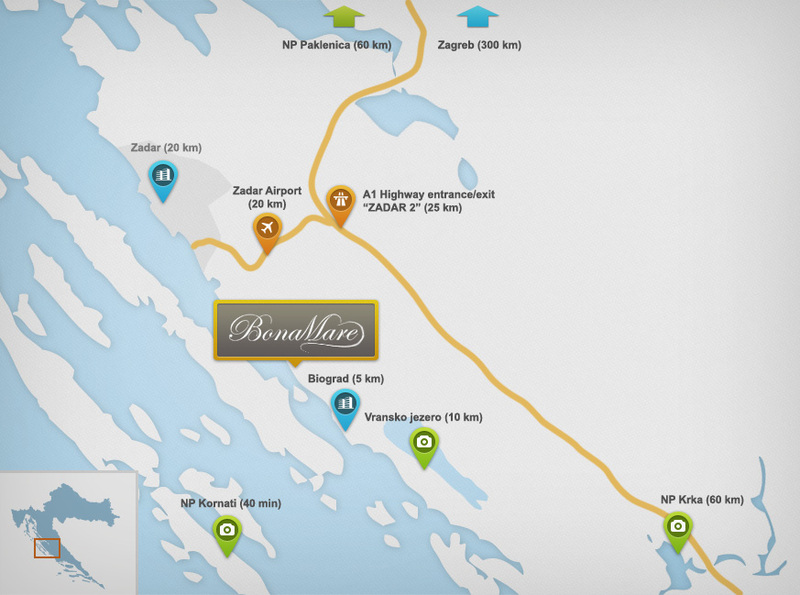 About twenty kilometers from BonaMare house spreads Zadar – a small Mediterranean metropolis. The city with 3000-year-long history bears the traces of the past – traces that turn Zadar into a city-monument. Today, Zadar is among the shiniest pearls of Croatian tourism, while its excellent traffic connection and significant tourist development over the recent years place it at the top of Croatian tourist offer. Whether for its monuments of culture or world heritage sites, rich gastronomic offer or cultural events, world-famous attractions like the Zadar Sea organ and the Greeting to the Sun or entertainment – Zadar is always an inevitable destination on the Croatian tourist map. It is the city about which many poems have been written, the target of many conquerors in the past and the breathtaking site that is absolutely worth visiting during your stay at BonaMare house. Among the aforementioned National Parks, within the circle of a few tens of kilometers around BonaMare house, there are three: Krka (60 km), Kornati (40 minutes by boat) and Paklenica (60 km). Vransko jezero Nature Park is located on just a few-minutes-drive by car. Whether you are interested in exploring Zadar and the region or you just want to indulge in the sensation of the sea, BonaMare house is an ideal place for you.